Saturday morning, I and some others from the Carnage crew and Upper Valley gaming community headed down to the Game Castle, Londonderry, New Hampshire’s local game store for Carnage at the Castle, to get the word out about Carnage to the New Hampshire population and get some board games played in the store. In addition to plunging in to playing about a half dozen different board games, most of which I had never tried before, I got to meet a couple New Hampshire gaming personalities: Randy, who’s been involved with Econocon for a very long time, if not its inception, and Wayne, who heads up the Sages of RPG, a Seacoast-based gaming group. We got into a loop of passing cards around, Randy and Wayne for their projects and me for Green Mountain Gamers. All in all, it was a fun time. I went into it feeling leery, because I’ve become picky of late about dealing with new board games, but overall I liked what I played. Ave Caesar with the “mean” variant was a hoot, though I can see it would require players with the right temperament. Burlington, Vermont to Londonderry, New Hampshire and back with ten hours of gaming in between is a hell of a haul, though. I can understand why no one ever wants to come up here for events. 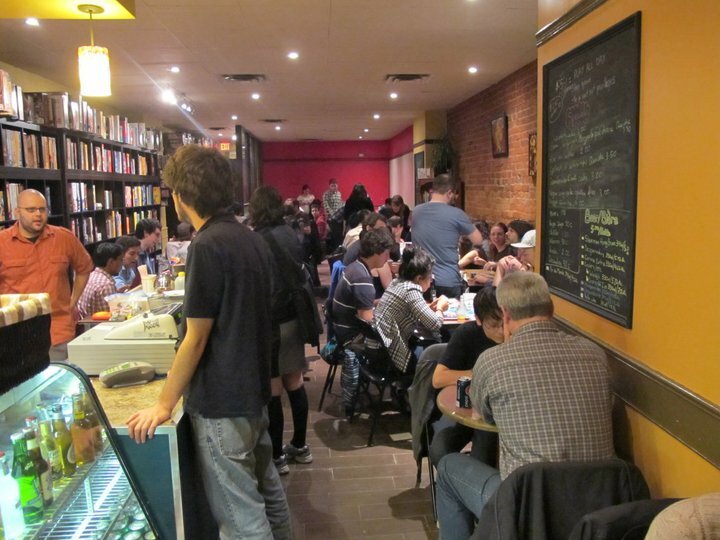 Packed on a Saturday night, Snakes and Lattes, Toronto, Canada. Photo by R. Mosco. Dominion at Snakes and Lattes, Toronto, Canada. Photo by R. Mosco. My favoritest game ever. Snakes and Lattes, Toronto, Canada. Photo by R. Mosco. A friend of mine recently visited Toronto, sending back these pictures you see to the right. They show Snakes and Lattes, a board game cafe on Bloor Street. Boasting a library of 1500 plus games, Snakes and Lattes also has, unsurprisingly, drinks and food. The owner(s) recognized the key fact that people playing games like to snack. Good for them. Others have pointed the weird dichotomy in game stores: they’re places of business, but they can also serve as community centers, in either form of shooting the breeze at the counter or spending time in a designated play area. There aren’t a lot of retail businesses around these days where this still happens. People might have used the archetypal general store in a similar way, but not so much the Gap or Waldenbooks. Which isn’t to say a game store can’t fill that role, but it’s atypical these days, particularly as social interaction moves online in the parts of the world where the internet is available. For game stores that offer play area, it’s always been a question of how to make that space pay for itself. There’s rent on that space to be paid, but the people using it are not necessarily buying product at a rate to make the proposition feasible. I’ve heard of some stores that rent table space for a couple bucks an hour, not unlike a pool hall. Myriad Games in New Hampshire has a somewhat byzantine customer membership program that I didn’t really grok when I read the flyer. It must work, though, or they wouldn’t offer it. So how can you have a semi-public space where people can play games that is financially feasible? Sell them food! 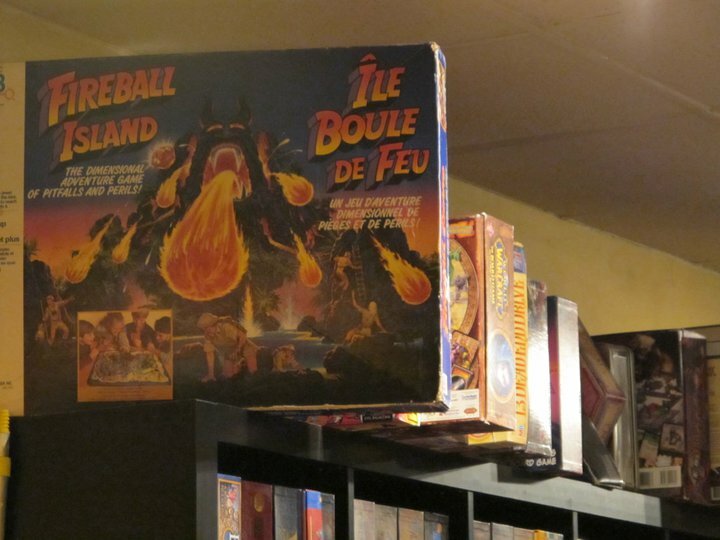 A board game cafe not only allows people a place to play a board game, but they’re still doing a trade in coffee and food, not just to people who’ve come for Fireball Island, but all the usual passersby who want a quick bite. There are some drawbacks to the model. 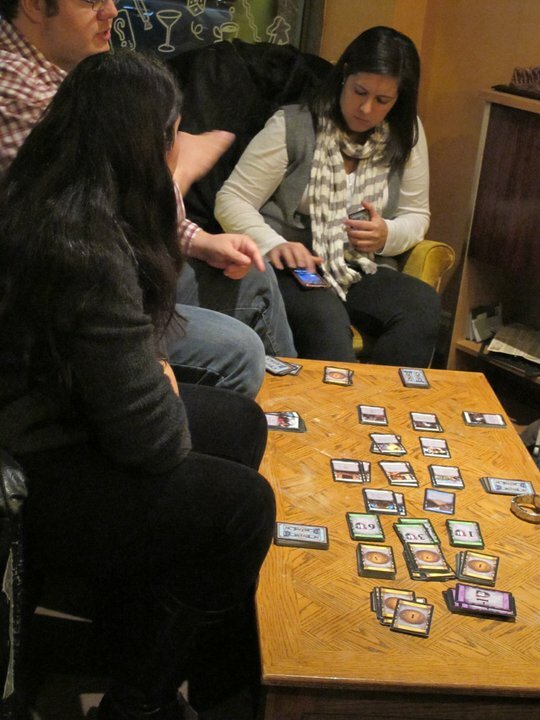 A cafe isn’t going to want to host space- and time-intensive games like Twilight Imperium or Arkham Horror. Role-playing games probably wouldn’t fly too well, either. But the relatively short board games that are on the rise these days are a terrific fit for a business model where people may stay for an hour or two, then go along their way. The one thing a business like this needs is population density. Snakes and Lattes will do just fine in Toronto because they can hawk coffee all day and night. In Vermont, with significantly fewer people, this would be a much tougher proposition. One of these titles is not like the others. Stocking a game store is a rough job. There are at least four distinct areas of product in the tabletop game hobby: board games, collectible card games, miniatures and role-playing games. Part of running a store is knowing how to display the contents of each of those areas in a way that makes sense to people who literally come in off the street. It can require an almost encyclopedic knowledge of just one particular area of the hobby to know how to organize stock sensibly. With role-playing games, it can get even more complicated. At Quarterstaff Games, it’s a bit of a crap shoot. Books by a particular publisher tend to clump together, but the publishers never seem to be alphabetized, nor are game lines sorted by genre particularly strongly. Furthermore, it’s not uncommon to see books placed together based on similar form factors. 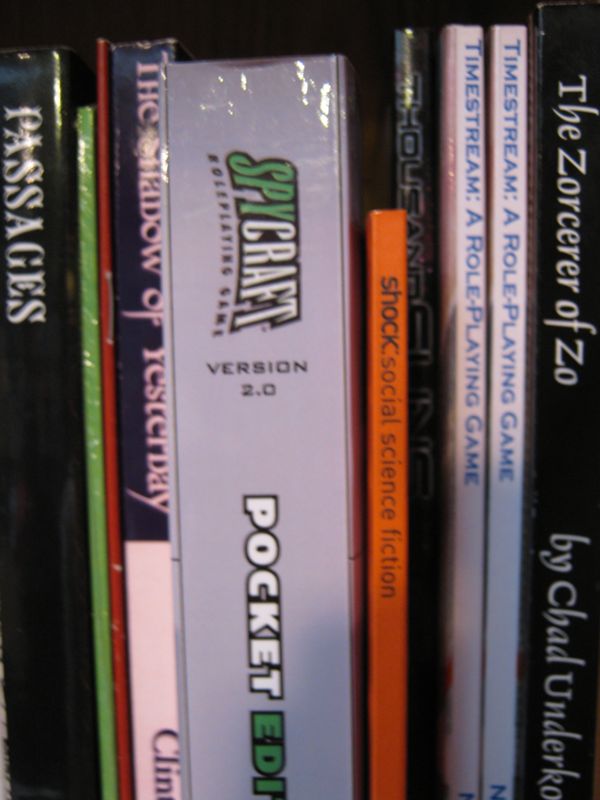 In the case of the pictured books, there’s a selection of the so-called indie set, typically published as one-off, hyper-focused games, plus the pocket edition of Spycraft 2.0. There comes a point where any role-playing games that aren’t Dungeons & Dragons or a closely-aligned substitute are going to hang together, regardless of marketing gimmicks. Wonderful as Spycraft is — we had a lot of fun using the Stargate iteration a couple years back — it can’t have much bigger a share of the role-playing population’s time than any other title, regardless of who publishes it. Long story short: from outside the role-playing hobby, it’s all the same and there’s little use in getting divisive and crabby. Free role-playing games keep cropping up lately. Friday morning, I listened to All Games Considered‘s rundown of Free RPG Day’s 2010 offerings, then found an interview by Chris Heim with Aldo Ghiozzi. It sounds like this year is going to have a mix of older material like the Exalted 2nd Edition quickstart and Hollow Earth Expeditions, and brand new stuff, namely the Dark Sun adventure for Dungeons & Dragons for which so many people have expressed their great desire. I would have liked to check out the Age of Cthulhu adventure myself, Abominations of the Amazon. Unfortunately, the local store, Quarterstaff Games, has opted not to participate in Free RPG Day this year. It’s disappointing to me as a consumer who likes to get interesting free stuff, but I can understand the logic. They reportedly still have an excess of material left over from last year. Only eight people, including GMs, actually spent time in the store and played through a game, as I related last year. I couldn’t say how many passed through the store just to pick up freebies and leave. So I guess I can understand why they wouldn’t find it worth the expense to order another box of materials. Just after reading the interview with Aldo Ghiozzi, I came across this post by Youseph Tanha at Stargazer’s World reminding everyone of the directory of freely available role-playing games compiled by John Kim. It seems, however, many of the links contained there died over the years, so The Free RPG Blog began to compile a Delicious directory of free games, as well. So even if there isn’t a retailer in your area supporting Free RPG Day, you can still get your frugal game on. And if you’re in travel range of the Burlington, Vermont, area, come on by to the Green Mountain Gamers’ Summer Game ‘n Grill. It’s free, too, though donations are always appreciated. The second part of the double whammy is the article is now making the rounds of the Twitterverse. @Boardgamenews tweeted it first, and it’s been retweeted since then, including by yours truly, @heldaction. So I am confronted with something of a dilemma and I thought I might throw it open for my readers’ input. The local game store is selling their new World of Darkness books for forty percent off. This caught my attention because I like the idea of picking up the remainder of the Changeling: The Lost mini-line, excepting Swords at Dawn, in one fell swoop for about $90. However, it’s hard to justify the purchase because the odds of me running a Changeling game that utilized the books anytime soon are relatively slim and I already have a backlog of roleplaying books to read just for the sake of reading — which ties back to the whole “slim odds of running a game” problem. Given that, dear readers, I invite you to vote in the poll below about what I should do. Flashback! My first visit to a game store, local institution Quarterstaff Games, happened some time around the age of twelve. I had asked for a Spelljammer box set for Christmas, having greatly enjoyed the tie-in novels. The Waldenbooks clerk forewarned us I would need special dice, and could get them down the street — why someone that knowledgeable neglected to mention that Spelljammer stuff was an add-on to the basic Dungeons & Dragons game, I’ll never know; confused, I wound up returning the box set for store credit, spending that on — probably — TSR novels. So down I went to Quarterstaff with my mother, along Church St. through the cold, slush and shopping crowds. It was, at the time, a relatively dim store, partly thanks to the sparse lighting left over from its previous existence as a bar and the dark wooden decor. The counter, once a bar, and trim all around the store, was stained dark. It was, to my mind, very atmospheric, especially with the torches in their sconces and crossed spear and quarterstaff behind the counter. The store was also ridiculously over-crowded with merchandise. Every available surface space had something on it. I remember in particular the stacks of dragon miniatures piled on a railing enclosing a raised level. At the time, I didn’t get how such intricate, colorful miniatures of dragons, of all things, could be packed into a flat little rectangular box. Most of the visit is a blur now. I do remember asking the clerk what dice I would need and walking away into December’s early twilight with two of each type of polyhedral die, plus a third d6, in the inner pocket of my winter jacket. Those dice never saw action, sadly. They gathered dust and eventually disappeared. But that marks the beginning of my relationship with Quarterstaff Games. I remember going back to browse the RPG books, and was particularly fascinated by the Encyclopedia Magica series. Later, when I encountered Magic: The Gathering in middle school, I’d make many repeat visits to the store, racking up enough purchases, with my brother, to earn the 10% discount card. I still remember the afternoon I went there with school friends and watched one of them sift through a newly-purchased starter deck to find an Aladdin’s Lamp as the rare — not that I got the concept of card rarity or how packs were sorted then. After I got out of Magic, just as the Homelands expansion released, I didn’t go back to Quarterstaff for years, except maybe the occasional visit to admire the bizarre mix of enticing products and clutter, like the fleet of Lego pirate ships that lived in the back room with the Gauntlet arcade machine and Han Solo cardboard cut-out figure. More than fifteen years later, Quarterstaff Games is still my go-to shop for RPGs and board games, as well as playing board games there most Tuesday nights. Admittedly, part of that is there’s little in the way of choice in Vermont for hobby stores of any stripe, but it’s also because I have history with the place. That counts for something with me.